In 1996 right to choose Eurovision singer has returned to RTR broadcaster, which using quite successful experience of 1994 again runs open national contest. It was broadcasted on 2nd of March (with drawing ceremony that took place a day earlier), contest was hosted by Yuddiph, winner of same event in 1994. Jury of the contest included some professionals and was led by Alla Pugachova, also consisted of A.Rybnikov, I. Otieva, P. Ovsyannikov and other. There is one song that I had performed back in 1969 for the comission of Soviet talent show "Hello, we're searching for talents". Then I saw it during one contest on RTR TV in 1993, when it was performed by some 16-17 years girl, who honestly told, that she doesn't know the author of this song, but she likes it, and thus performs it. I was watching this from my bed, I just got up and by accident switched on TV. And another accident with this song happened in 1996. One evening my neighbour runs to me and says that at "Eurovision" some one is performing my song «Nekrasivaya». I'm not fan of this contest and was watching something else. I swithched the channel, but was late and didn't see the performance. But I learnt that this is again RTR and it is Russian Eurovision Preselection final where they were selecting representative for Eurovision final. Thus I have to go back to Shabolovka office, 27 years later, and to get the recording. It was found that song was performed by some Timur Gorskiy, who also claimed to be lyricist of the song, and music was written as composed by Igor Velichkovskiy, known for his work with Lada Dance, Technolody and Strelki. Song was in a very strang arrangement, from the ballad it was turned in a disco with some girls on backing vocals. One verse was lost and a new verse was added. This is different but still interesting story. Timur was found to be some Muhtar from Dagestan, but he disappeared. Court admitted that I was author of the song written in 1967 (!) and illegaly performed at RTR in 1996, but didn't ruled for any compensation for me, as it was not found who was the reason of putting of Gorskiy and Velichkovskiy as authors, Velichkovskiy denied he did it. In private talk he admitted that the song was suggested by Muhtar, who sang it in his childhood, and he only wrote the arrangement and pushed it to preselection. I told him other story, when my female friend heard this song in some Kazakhstan village performed by choir as traditional song, but that was not even funny. - I was preparing disc with working title "Me it is Me". The song did not exist at that time. So I'm working and I heard on TV advertisement of the contest. And I am very lucky at contests, I always win something there. I have a lot of prizes from jury and viewers. All TV sets that are in my home, for sure. Even motorbike was standing in the room as prize for "Schlager 93". At first I was not going to participate, but then I took a risk. Submission deadline was 4-5 days away. I called Tver, where I was recording that time and asked to help. We should have prepare song very quickly. And on the last date I brough demo tape of the song to RTR. And when I was called and informed that I entered 14 best, I even had tears of happiness, I was not expecting it. And no one of my relatives and friends did. Contest-preselection was really honest. I discovered this at the drawing event when I met other contestants. We were not aware before it who other contenders are. And I met a lot of my friends and colleagues there: Andrei Misin, Igor Kornelyuk, Volodya Trushin, Sergey Rogozhin and other performers from St. Petersburg. We met, clasped each other and were supporting each other. I'm from Leningrad too. The most interesting that jury was not in the hall. They were in other building, may be even in other region of Moscow. And we were not aware who was in the jury. Later we found out that there were 16 persons - 8 professionals (Rybnikov, Pugacheva, Otieva, Ovsyannikov, TV editors, music professors) and 8 people "from the crowd" (engineers, soldiers, workers etc). Everything in the way RTR conducted preselection was great and very professional. And this is the way preselection should be run in every civilized country. Win brought me three broadcasts of my song on TV during one night - that's a big achievement (laughing). Then everyone was congratulating me. Победа принесла аж целых три эфира песни "Я это R" за один конкурсный вечер - большое достижение (смеется). Потом все поздравляли. Приятно. Телефон разрывался. Приехал домой после интервью - 25 сообщений. Ну а дальше надо было что-то для себя выбирать. Really, I think I was not good enough myself. I have results of voting, here for example is sheet of UK, it was not voting against Russia, it was voting against other countries. There can be different explanations. But I myself explain this like - no luck, this is a pity. I know that if I were qualified to the contest I would have performed very successfully there. I take my performances very accurate. I would have been performing with a low squad of musicians. Myself sitting with the favorite "Wurlitzer Piano" with string quartet and vocal band. This will kill everyone on the spot. Before Russian preselection I had not time for preparation, that's no time to get confidence. I was so trembling that I can not even took the notes. I was even asked to find other suitable singer for my song. But I told that I will cope with everything and will perform myself! And I did it. Style Andrei Kosinsky and his band Kosinski works in can be characterized as "european pop-music". 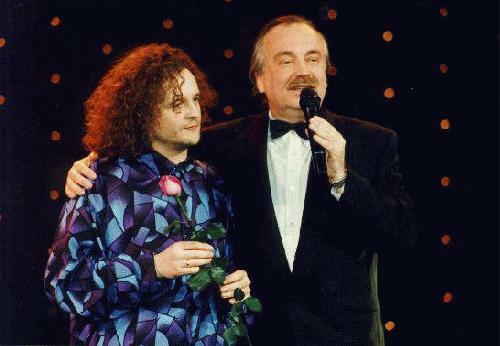 He had issued 2 albums "Pervaya Kollektsiya" (First Collection) and "Posledniy vecher". (Last evening). Andrei Kosinsky is excellent instrumentalist and stagemaker for live shows. His works included shows by Valeriy Leontiev "Made in India", A-Studio "We are 10 years old", Alena Apina "Limita", Zhasmin "Perepishu Lyubov". He also produces and writes song for such an established singers like Nepara and Elio. Chisty, pusty ulitsy v nochi. “Kto ty? Kto ty?" - veter vsled krichit. Slyshu v chyornoy mgle: “Kto zh ty na zemle?" Eto zhizn' moya: ya - eto ya. B'yutsya struny vo mne i zvuchat stihi. Vse oshibki moi i moi grehi. Goryat mechty v plameni kostra. Ya szhyog moi mosty, chto proshel vchera. Vnov' peredo mnoy chey-to put' chuzhoy. Gde zh tropa moya? Ya - eto ya. I hear in the black haze: "Who are you on this Earth?" This is my life, and I am what I am. All my mistakes and my sins. I hear warbling of the nightingale. Where is my path? I am what I am.